The quality of breeding research depends on the skills of field technicians and the quality of data they collect. A two-week participatory training to build capacity of research technicians on sorghum and millet breeding techniques, was held as part of the ‘Harnessing Opportunities for Productivity Enhancement of Sorghum and Millets in Sub-Saharan Africa’ project, where ICRISAT is working on strengthening local capacity. Facilitators regularly encouraged trainees to share their individual country experiences. They were also challenged to work towards modernizing their breeding programs and make sure they utilize the wide germplasm base that exists in the region to generate better cultivars for increased genetic gain. The training included plastic bag emasculation, hot water emasculation, hand emasculation, pollination, crossing and field layout. It also promoted digital data capture using a data collection software called the Kansas State University (KSU) field book application. This is uploaded in the Breeding Management System (BMS) which is an integrated system for data management. Trainees learned designing of trials and generation of nurseries in BMS, creating field labels and field layout, writing field data books and data management and analysis. The final day of training was spent at the ICRISAT genomics lab in Nairobi, where Dr Damaris Odeny, Theme Leader-ESA-Biotechnology, Genetics Gains Program, ICRISAT, and her team presented basic molecular procedures. Trainees learned how to sample and freeze-dry plant tissues for long-term storage. They also extracted DNA and checked the quality and quantity of DNA before downstream analysis. This was an exciting activity for most participants as it was their first experience in a molecular lab. The training was organized by ICRISAT – Kenya. The two-week training was held at the Kiboko Field Station from 9-22 July. 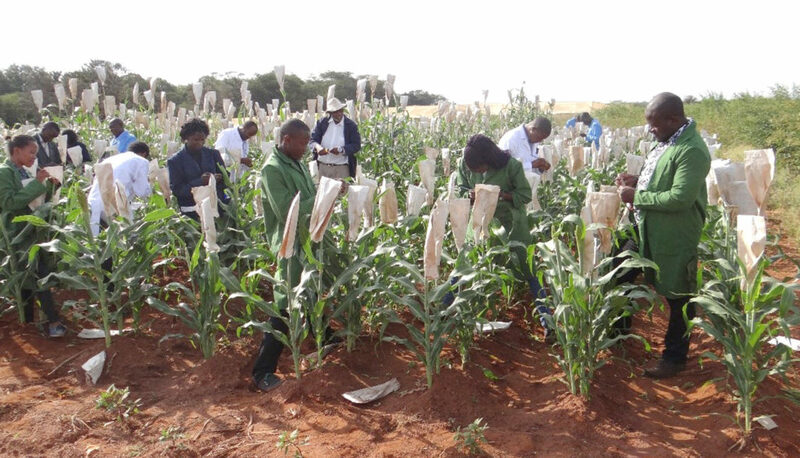 It was facilitated by ICRISAT’s Dr Henry Ojulong, Senior Scientist – Breeding; Dr Eric Manyasa, Scientist – Cereals Breeding; and Field Research Technicians – Patrick Sheunda, Joseph Kibuka and Julius Ombaki. Partners: Ethiopian Agricultural Research Institute (EIAR), Ethiopia; Department of Research and Development (DRD), Tanzania; National Semi-Arid Resources Research Institute (NaSARRI) of NARO, Uganda; Institut de l’Environnement et de Recherches Agricoles (INERA), Burkina Faso; Institut d’Economie Rurale (IER), Mali; Institute for Agricultural Research (IAR), Nigeria, ICRISAT and partners.